A Talking Cat!? !, a movie about a talking cat, opens with the voice of Eric Roberts. Golden Globe and Academy Award nominee Eric Roberts. Brother of Julia Roberts Eric Roberts. You see, Eric Roberts is the voice of our titular talking cat. The first thing you’ll notice about A Talking Cat!?! is the sound quality. Or, rather, the lack of sound quality. Eric Roberts sounds like he has been awake for three days straight and is recording his voice over into a tin can in an echoey cave with only one sleeping bear to use as sound dampening. I wouldn’t say Eric Roberts phoned in his voice work. It would be more appropriate to say he mumbled it into a quarter full bottle of gin while someone struggled to get him into his pajamas. Did I mention A Talking Cat!?! is a family film? What are the audience’s eyes treated to during this voice-over catastrophe? 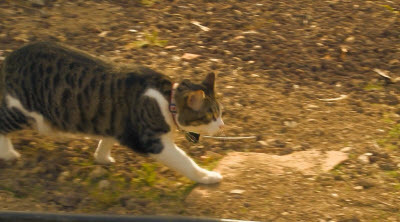 Shots of nature and a cat walking and rolling around in it. I know what you’re thinking. “Aric (that’s me), I shut my eyes for a few seconds and didn’t see all the nature and all of the cat walking around in nature.” DON’T WORRY! You will see the same shots used over and over throughout the film. Why are you worried about that, anyway? And now, the content of the voice-over. Eric Roberts is our Puck. The talking cat is a mischievous nymph that leads us by the hand through our story. And what a story! So A Talking Cat!?! is going to be a story about becoming less reliant on technology? NO! I don’t even know what this movie is about and I’ve watched it. We’ll get into that later. But for now, a drunken cat is wandering through the woods while complaining directly to the audience about technology until the opening credits roll.